I attended the second forum at the Translink headquarters on Monday. Somehow I seem to have missed the whole phase 1 of this project. However you can always go to the translink website and catch up. This example shows how a simple fare policy change can have a major impact on system costs, crowding and passenger comfort. This is the first time I have ever seen anything as official as this which admits that the decision was wrong. Full disclosure, I was at the time a relatively new employee at BC Transit. I was not by any means unfamiliar with transit fares policy and how it can be evaluated, but what astonished me at the time was how few people with whom I was working seemed to understand some simple, basic principles. I had, however, got used to the response I heard about how I was new and therefore could not possibly expect to understand how this system worked. I would ask you to take note that there is nothing at all on either axis of this graph to show what is being displayed. Time of day is not to hard to interpolate, but the ridership top and bottom does need some indication of value, I think. The Transit Fare Review is a comprehensive review of Metro Vancouver’s fare structure that aims to recommend fare policy changes that will increase transit ridership by delivering a better customer experience and improving system efficiency today and into the future. It is comprised of four phases: Phase 1 (Discover), Phase 2 (Define), Phase 3 (Develop), Phase 4 (Deliver) running through to 2018. 2. Will report back on how the feedback contributed to the decision-making process. 2. Participate in the Stakeholder Forum meetings or send a delegate. Each organization is asked to send one to two participants to appear on their behalf as their representative. TransLink is seeking a commitment from organizations for consistent participant attendance at all future Stakeholder Forums during Phases 2, 3 and 4, in order to ensure continuity. All stakeholder feedback will be shared with TransLink staff and considered as advice. One to two stakeholder forums will be held per Phase. All Forums will be held over the next 24 months. Advance notice of Forums will be provided. Forums will be held during the day time at TransLink’s head office in New Westminster. I am going to record what I heard, but I would encourage you to go online and take the survey if this material is of interest to you. The meeting was opened by a facilitator from Modus who emphasised that we were “not deciding anything” but rather reporting what we were “thinking and feeling”. Many of the people present were representing groups – “stakeholders”. A show of hands demonstrated that most of them had not been present at the first meeting – though there might have been someone else from their organisation. Only three factors in the fare structure were going to be discussed – distance travelled, time of travel and service type. The findings of the meeting are reported on line – but the first two were actually available at the end of the meeting. The goal was to recommend changes that would increase ridership, be simple to understand, fair and affordable. The structure of the fare system is supposed to contribute to the quality of service. It was emphasized that “the most economically vulnerable should have access to transit”. Phase 1 of the exercise had shown that there was not a lot of support for the current three zone system. The rest of the meeting was taken up by working in small groups to look at more detailed questions relating to these issues. At each subquestion we were presented with a large poster on which to affix sticky notes with our comments and “votes” using coloured sticky dots. At my table were a couple of representatives – one from the Metro Vancouver Alliance and the other from a union. They said that they felt the zone system- and fares by distance – are “erecting walls” and intended to “keep people in the poor part of town”. There is an issue of social isolation due to both cast and lack of access to services. Professor Robert Lindsay of the UBC Sauder School said that fare by distance was a better representation of the cost of providing service than zone system and should be preferred for “economic efficiency”. There were also comments that the concentric rings of the current zones do not reflect current trip making which is now much less oriented towards commuting between the suburbs to Downtown Vancouver than when the zone system was created. It was suggested that if there were to be a new zonal system it ought to reflect the multiple centres of activity across the region. It was also necessary to reflect the difference between the journey to work and other types of trip purposes. I pointed out that one of the major differences was between the grid system of routes in the centre of the region versus the hub and spoke of the suburbs. Great concern was voiced about how the route structure in the suburbs imposes longer distances through indirect routings (to increase ridership pick ups) and transfers. I also expressed my reservation about recommending any finer gradation of fares while the Compass system on the bus does not include a “tap out”. Translink representatives assured me that this was a temporary problem that was about to be fixed. One of the major concerns about the time of travel section was the need to reduce overcrowding and pass ups. There is currently no incentive for people making one zone trips to change their time of travel to avoid congested periods – and this was made worse by making the bus system one zone all the time. When looking at travel by service type it was pointed out that the current service provision generally does not allow for service duplication: for instance, there is no bus service over the Patullo Bridge, so SkyTrain is the only transit option. I also pointed out that there is no direct express bus service between Surrey and Coquitlam centres – both major regional centres – but only an indirect, double transfer SkyTrain ride. When the results of the analysis of the voting on the distance and time questions were presented it became clear that the group I was part of was not representative of the rest of the meeting. One thing that did become clear was that there was an almost complete absence of hard data to inform the people present of the results of their choices. But one thing that the Compass system ought to have provided by now was a wealth of information about how people in real life make choices about their travel. For example, the decision to make bus a one zone ride means that there is now a choice by fare for journeys to the North Shore. It is now a one zone bus ride or a two zone SeaBus trip. While we were all busy doing stated preference, there is a whole bunch of much more reliable revealed preference data. I was not all surprised to be told that Compass data is proving difficult to analyze, and that none could be made available due to privacy concerns that is currently preventing data collection on mixed mode “linked” trips. Equally since there is no tapout on the bus, distance travelled can only be interpolated from other sources. While I do encourage you to go online and take the survey, I feel it is only fair to point out that the reason Translink chose to buy Compass was that it would make fare by distance feasible. Gates at SkyTrain stations could have been operated by the previous “mag swipe” fare media – which is what they use in New York City. A single zone system to this day. 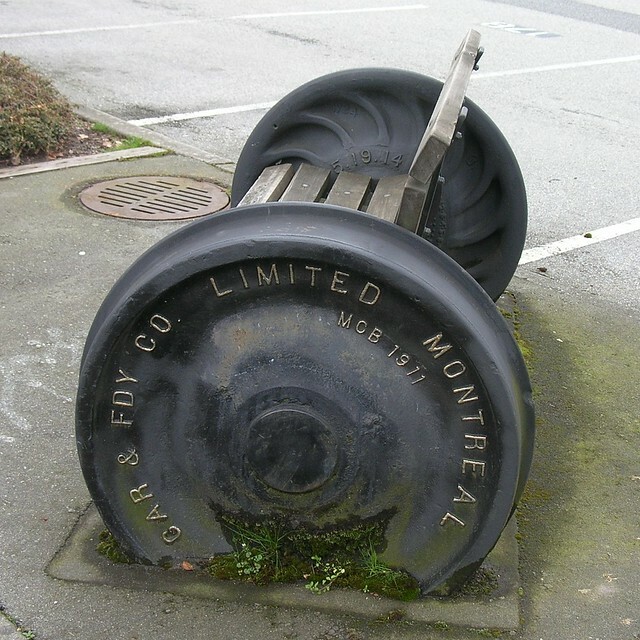 This bench is made from a repurposed railway wheelset – two wheels welded onto an axle to make one solid unit. The ends of the axle have been cut off and smoothed over to reduce hazards to passing pedestrians. It is located on the former CP railway line through Kerrisdale that has now become a greenway for cycling and walking. Reply to article Optimist Jan. 20 2017 “Due diligence done on bridge” The Minister of Transportation and Infrastructure Todd Stone makes some statements that need to be answered. Although the decision has been made to remove the George Massey Tunnel and build a new 10 lane bridge I feel the following information should be shared. On May 25, 1959 the Deas Tunnel (George Massey Tunnel)as it was known then was opened for traffic. In the first 41 hours 135,000 motorists travelled through the tunnel, this exceeded the tunnel’s rated capacity of 7,000 cars per hour by 300 additional cars. On April 26, 1960 George Massey received a letter from the B.C. Toll Highways and Bridge Authority that stated that 1,000,000 mark in the number of vehicles using the Deas Island Tunnel (GMT) was reached on Oct. 31, 1959. One has to remember that there was no port or ferry terminal at that time. If the statistics from the BC Ministry of Transportation and Infrastructure are correct that in 2015, the Annual Average Daily Traffic was 80,666. which would equal some 3, 361 vehicle per hour, well below the GMT tunnels capacity of 7,000 cars per hour, why then is there a problem at rush hour? Could it be that Delta Port is the only major port in North America that does not operate 24/7? The fact that one container or large transport truck could displace up to 1.5 to 4 cars and subject to the fact that heavy trucks take up more space and are slow to accelerate could result in taking up the space of up to several more cars, perhaps up to 10 cars on the road,as at least 13 % of the vehicles using the GMT during rush hour are large heavy duty trucks. One has to ask why then has the B.C. Ministry of Transport and Infrastructure not even considered a modern day policy of banning all heavy duty large trucks during rush hour, and requiring all receiving and delivery points of cargo to be open 24/7 as is required in most cities around the world? My second point refers to the statement the Minister made that it is a fallacy how anyone could think that they are removing the GMT so that the Fraser River could be dredged deeper to accommodate deeper ships, and that the province was not part of that project, could not be further from the truth. One part is true that they would not be doing the dredging because that is the responsibility of the federal agency, Port Metro Vancouver. But building a bridge and removing the tunnel would be their preference. and at the urging of industrial interests of the Pacific Gateway Strategy Plan on the Fraser River they chose the bridge. A representative from the Ministry of Transportation and Infrastructure was present at meeting of the Pacific Gateway Strategy Plan on April 2006 and on Feb. 2. 2012, the Assistant Deputy Minister of Transportation and Infrastructure of the B.C. government met to discuss the constraints to increasing the Fraser River channel depth because of the existence of the George Massey Tunnel and recommended the removal of the George Massey Tunnel to achieve their goals. So you see Mr. Minister and the public it was not a fallacy but a conspiracy. 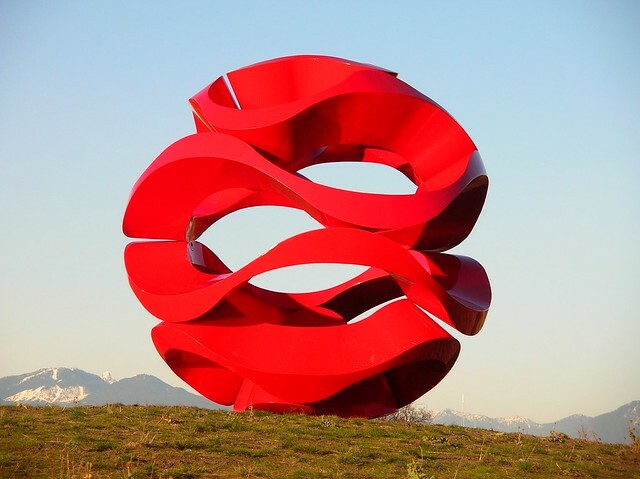 The sculpture is called “Olas de Viento” and was installed in Garry Point Park in the City of Richmond BC by the Vancouver Biennale. The photo was taken in December 2009. I was very taken by the subject and made several images at that time. The City decided not to buy it and by March 8, 2012 it had gone. It is now installed at Herman Park in Houston, who clearly have much better taste than the Mayor and Councillors of Richmond. I asked my partner if she could think of one of my photos that had “ambience”. I used my best French accent on that word which must have influenced her choice. This is the interior of the Palais du Louvre in Paris. This is part of Louis Napoleon’s apartment – his personal quarters – decorated at enormous expense to the state, and defining the taste of the Second Empire. The following is the text of the President’s farewell address, taken from the New York Times webpage which, for reasons which pass all understanding, refused to let me see their video. So I have actually already whitelisted Wired – as the screenshot shows – but instead of showing me the page I get the appeal. Again. Which I have already answered. Yes you are whitelisted. I will put up with your ads. Show me the content, dammit!